Remember how Daft Punk asked its fans to bring their video camera’s to the Keyspan Park Brooklyn concert. Will they just finished up editing all 250 camera’s into one giant camera mash up. Its pretty intense and might cause you a seizure but it its a great flashback to the event. It’s taken from the ‘Alive’ DVD, directed by Olivier Gondry & released at the end of November. I know I have been making a million posts about the Daft Punk show, but it was so amazing how could I not! Anyway I came across this pretty good quality live recording of the show at Keyspan. If you don’t mind some crowd noise its worth the listen. 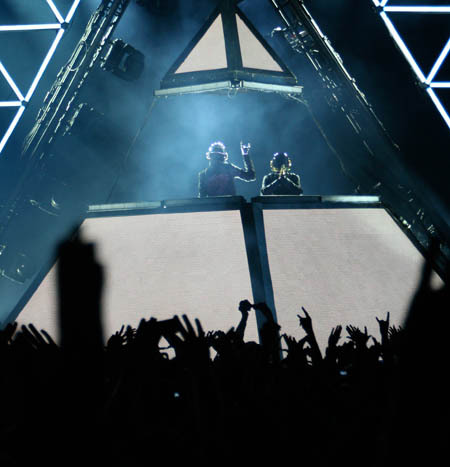 Daft Punk in Keyspan — Amazing! Absolutely off the hook night. Best night of the summer. A teeny amount of rain, cool weather, amazing lights amazing sound, amazing crowd. Video’s will be posted in a few hours but I wanted to get this up ASAP! God! I am so excited about this concert. I haven’t been this excited about a show since I was 15. Tickets are obviously sold out but you can pick them up scalped i bet. The above youtube is Daft Punk’s LA show. HOTTNESS! Now you can make your own Daft Punk helmet for less than a 100 dollars!